If you're a guy and wish wear makeup, you're not alone. In fact, many men secretly wear it every day, they just don't broadcast it. In today's society, it doesn't make you less of a man, it may help you cover flaws and enhance your finer features. You don't have to be an actor or movie star to wear makeup. Both metrosexuals and so-called "he men" also enjoy the benefits. More and more men are discovering what women knew all along; it boosts your self-esteem when you look your best. Some cosmetics companies are cashing in on a whole line of skin care creams and makeup, specifically for men, and they're buying it. Popularity aside, the trick is to know the look you want and apply it accordingly. We're not suggesting that you wear all of the makeup listed below. Pick and choose the cosmetics that will work best for the look you're trying to achieve and do some experimenting. Remember to buy matte varieties and avoid frosts and glitter, unless you want to look like a girly man. Wearing foundation helps cover imperfections, flaws and pimples. If you have a beard, it's not recommended because it tends to look inconsistent and leaves unwanted residue on whiskers. If you have facial hair, you can use a concealer instead, to hide spots and blemishes. Since most men have larger pores than women, they clog up easier. An oil-based foundation may make you prone to breakouts and zits, so look for a type that is water-based and thin. Apply it sparingly, one application only. Remember, blending is key, so rub it into your hairline and neck to avoid lines that will give telltale signs that you're wearing makeup. If you're squeamish about wearing foundation, opt for a tinted moisturizer which will soften your skin after shaving and add a touch of color or tan. If you can't find a brand for guys, you can look in the women's section, but beware of finding one that will add shine or sparkles to your skin. Look for a basic moisturizer with a light tint and no frills. Again, find one that will compliment your skin tone, not change it. Bright lights and warm temperatures have a tendency to make skin look shiny and clammy. The main purpose of powder is to take away the shine, which is very important to those who work on stage or a photo shoot. For a natural look, forego the foundation and wear powder only. When you apply it, focus on areas that are the most shiny; your forehead, nose, and chin. 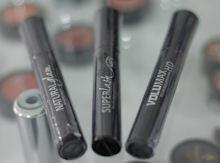 Popular choices for powder include pressed (in a compact) and loose. Pressed powder will come with a powder puff (for lack of better term) for easy application. Loose powder is best applied with a large makeup brush, which is, most often, not included. Powder is available in different shades of color or translucent, meaning no color is added. If you want a gothic look, using wearing eyeliner is oh-so effective. Rock stars like Joel Madden and Billie Joe Armstrong pull it off well. Generally, if you have a masculine face, you'll want to apply it lightly. Use a black eye pencil to draw a subtle line underneath your lower eyelashes. Blend in the edges for a more natural look. If you have light or blonde lashes, you can use black mascara to match. If your skin is pale, tone it down and choose dark brown or brownish/black eyeliner. Don't overdo it or it will look messy rather than appealing. Once you're comfortable, you can try your own style to make a statement. If you want less dramatic features, use the eye pencil to fill in spaces between your eyelashes. This will make them appear thicker and fuller. Unless you wear dark eyeliner, you don't need to wear color-enhanced mascara. If you do, one coat will suit you fine. Use as little as possible to avoid clumps and flaking. Clear mascara is an ideal choice for men. It will lengthen lashes and give them volume. Another added benefit is that if it smears, it won't show because it's nearly impossible to see. Clear mascara also doubles as an eyebrow comb to keep strays in place. Wear lipstick only with a rocker style. Even then, you should wear it at your own discretion. Usually, lighter tones look unflattering on guys, so stick with dark shades that enhance your own lip color. If you want to look natural, wear a clear lip balm for a bit of kissable shine and protection from weather.